Those marching in the front were hurt, with Tass reporting from the scene that at least 15 people sustained injuries and 3 others were killed. Other outlets speak of four and eight casualties. At the moment, Ukraine Interior Ministry confirms two fatalities and 10 casualties. Interior Ministry head Anton Gerashenko gave the names of the two victims on his Facebook page: local activist Igor Tolmachev and a military officer identified as Lieutenant Colonel Ruybalchenko. He added that the explosive device was planted in a bank of snow along the march route. Witnesses interviewed by TASS also claimed the explosive device was thrown from a passing car, however, authorities appear to stick to the planted device version. Kharkov’s prosecutor’s office has launched an investigation into the explosion, describing it as a “terrorist act". “All victims have shrapnel wounds from a grenade blast. Three are in a serious condition,” said Aleksandr Galatsan, the head of the regional Department of Health. An anti-terror operation has been launched in the explosion's aftermath, said Anatoly Turchinov, head of Ukraine’s security and defence council. The adviser to the SBU chief, Markian Lubkivsky, said the service was aware of a series of terrorist acts planned for Sunday, RIA Novosti reported. Security services were able to give advance warning of a terrorist act in Odessa, said President Petro Poroshenko during his meeting with Polish President Bronislaw Komorowsky. The Polish leader was invited to Kiev by Poroshenko to attend the commemoration events to victims of the violence during the Maidan protests. Earlier in the day, 133 Ukrainian soldiers, freed as part of a prisoner swap with the rebel forces, arrived in Kharkov. 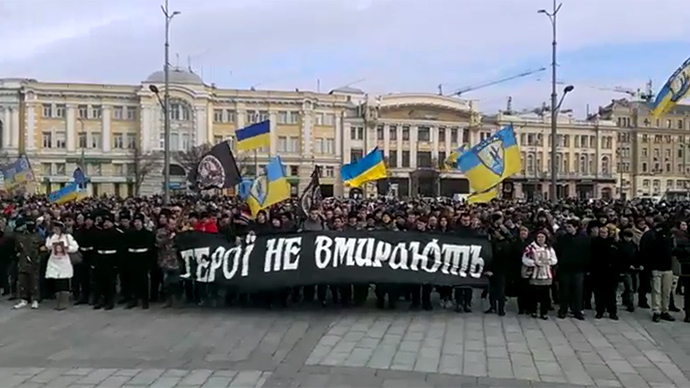 The march in Kharkov was organized in commemoration of the 2014 Maidan events, which brought about regime change in Ukraine. Kharkov, in northeastern Ukraine, is the country's second largest city in terms of population. The Kharkov region is under Kiev control and is close to the self-proclaimed republics of Donetsk and Lugansk.